Last week some friends found this link on the internet in a newspaper no less important that The Economic Times. Click there and the article was removed? Insulting the intelligence of voters is could be suicidal in an election year. In the 2008 US Presidential elections, Sarah Palin, the Republican nominee for the vice president’s post, committed that offence. 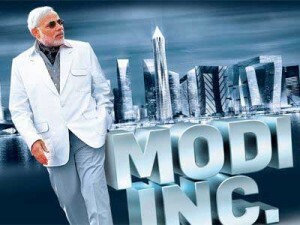 In 2013, is Narendra Modi following in her footsteps? When Palin started her campaign, commentators gave the ‘hockey mom’ a real chance. After all, she was folksy, which America loves, good looking and a would-be grandmother to boot. The concoction was deadly and Republicans lapped it up. A war veteran, John McCain as the head and a mommy as his aide fell in line with the American dream. Till this point, the script runs perfect. But the American dream crumpled when the mommy started getting her facts wrong. Palin was ridiculed when she claimed to have an insight into American foreign policy because Russia is the next door neighbour to her state of Alaska. Back home, Namo replicated that feat in his Independence Day speech at Bhuj. He almost took the same neighbourhood line as Palin and while lambasting Pakistan claimed that his voice reached Pakistan first and Delhi later. This came from the same man who some months ago had offered Sindh province in Pakistan, the ‘Gujarat model’ to overcome its power crisis. While Palin called Afghanistan a neighbouring country, Modi brought Taxila from Pakistan to Bihar. There is an uncanny resemblance between these two politicians in getting their facts wrong, again and again. Their supporters may term this as unpretentious behaviour. Perhaps, voters could have forgiven Palin, the winner of the Miss Wasilla pageant for not knowing what lie beyond the American shores but the crowd booed her when, at a public rally, she said that the state of North West Hampshire is in the Northwest of Americas. Modi so far has been spared this public ignominy. A closer look at their campaign and one gets a feeling that perhaps the fates of Palin and Modi are intertwined. Days after being nominated for the Presidential elections, the Republican supporters were shocked that Palin’s unwed daughter was five months pregnant. Palin, who by then had projected herself as ‘Bible-believing Christian,’ ultimately lost out on the traditional conservative Republican base. Modi, too, is now embroiled in a snooping scandal as his aide Amit Shah has managed to score a self goal against his ‘saheb’. In the midst of this jamboree these down-to-earth leaders and their supporters forget that the voter cannot be fooled, or at least for long. So, when Palin described that the Iraq War is ‘a task that is from God,’ voters knew that she was making no sense. Unfortunately for his supporters, Modi is catching up with Palin. After historical blunders such as calling Gandhi Mohanlal instead of Mohandas, and claiming that Nehru did not attend Patel’s funeral, Modi is now treading on more difficult terrain. In a Jodhpur rally, Modi claimed that he may not be as educated as the country’s finance minister but he knew that buying gold is not leading to inflation. His first lecture in economics may have got a thunderous applause in the rally but he might have lost the faith of voters who till then would have bought into his image as the deliverer of Gujarat’s vibrant economy. It is time that Modi should learn from the mistakes which Palin committed. After all he would not like to be remembered as Palin, who finally had to be told that there was no tradition of concession speeches by running mates, and that she would not be speaking. Not anymore.